Like the Russians in the 1990s, Greeks are learning that the climb from the financial abyss will be long, and it will hurt. Greece may yet escape default, but as other eurozone economies falter, EU leaders must ponder whether the common currency is worth saving – and at what cost. Greece is not capable of paying off its debts, nor even of servicing them – now or in the future. The “credit in exchange for reforms” programme has not worked. The measures that the EU is forcing Greece to take in order to obtain fi nancial aid are having a seriously depressing effect on the national economy, leading to a further reduction in the money flows it generates. Most of the multi-billion assistance is flowing through the Greek treasury to the creditors who are profiting from Greek bonds in almost the same way as 13 years ago they profi ted from Russian state treasury bills: the yield on Greek two-year bonds has approached 30%, something never seen before in the eurozone, and it is continuing to rise. Things cannot go on like this for long. It may prove possible to give default another name – in the same way as unrestrained issuing of currency is technically referred to as ‘quantitative easing’ – but there will be no way of avoiding it. This gloomy truth is absolutely obvious, and it is difficult to imagine anyone not knowing it, but the most serious of people – presidents, prime ministers and ministers – continue to act as though they’ve never heard of anything like this. Life today is more complex than it was when Hans Christian Andersen penned his tale of the emperor’s new clothes. Today, there are whole regiments of impudent lads crying at the top of their voice that the emperor is shamefully naked. Not one public analyst would now write off the inevitability of a Greek default. And who needs analytical articles? The terrible CCC sovereign rating that has now been given to Greece is more convincing. But nothing is changing: both the Greek authorities and European officials keep repeating that without new financial resources from the EU and the IMF Greece will not be able to escape a default. But will it escape even then? The Eurobosses, meanwhile, are playing the usual game of keeping mum: whichever official is fi rst to mention this default out loud will also be the first to bear responsibility for it. And there will be a lot to answer for. For a start, the serious difficulties being experienced by a number of strategic banks (mainly French and German), which got carried away with playing the highreturns game with Greek bonds. Then, for the worsening problems in the weaklinks in the eurozone after Greece (Portugal, Ireland and other stops along the way) and the quite plausible movement towards the collapse of the eurozone itself. In one sense Greece itself (not the government but the country) is risking less than anyone else: it already has virtually nothing to lose. Of course, a default and the sharp slump in living standards that that entails are more than unpleasant, but they are unavoidable. They have to be endured, but it is quite possible that new opportunities will open up in their wake, as they did in Russia after the twin heavy shocks of the default and devaluation in August 1998. And so for other participants in the process the risks are only beginning. Everyone has more or less grown used to the idea that the premiere of the play “The Ruins of Athens” will sharply increase nervousness on the markets of the other PIIGS countries. But the issue is more serious: there is no way to avoid a most unpleasant increasing focus on the little-publicised fact that for the more developed countries too the debt and budgetary burden is clearly rather big. Alexander Privalov is a leading economic journalist and an editor of Expert magazine. Not only can Greece keep its membership in the euro area, it can move towards reducing its national debt. The conditions for this to happen are, in every sense, hard both for Greece and the EU. It is unlikely that any country will decide to leave the eurozone in the foreseeable future, because neither the euro debtor countries (mainly the southern tier and Ireland) nor EU institutions such as the European Central Bank and European Parliament would welcome it. These institutions require much time to make important and difficult decisions because of the need to align and co-ordinate with all the eurozone countries, each of which meanwhile must deal with potential counter-actions, if not chain reactions, by banks, insurers, pension funds, and their respective central banks. Technically, the decision to abandon the euro does not seem possible at this time. For that reason, the problem of highly indebted eurozone countries will remain common to all of them. The euro is the string that binds up every member of the area from Germany to Ireland. Nothing less than an announcement of Germany’s unilateral withdrawal from the eurozone would be needed to make the “string” system fall apart. There is no sign of that happening. 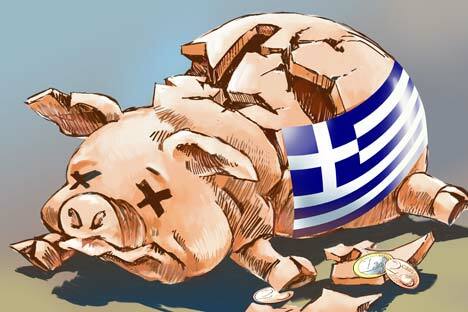 So what can the EU, the ECB and the Greek government do to take control of the situation and fi nd a way out? Their first step should be to take another look at Greece’s external debt. One reasonable and feasible idea is to exchange Greece’s bonds for EU institutional bonds. The ‘no-default debt restructuring’ option, for instance, envisages the use of the eurozone rescue fund, or EFSF, to exchange government bonds of Greece, Ireland and Portugal placed with foreign holders for EFSF bonds at a discount of 20-30%. This would reduce the national debt of these countries and drastically decrease their financing costs. This scheme also envisages the possibility of a chain reaction where the European fi nancial system would lose up to 10% of its capital base but still survive. The second step is to speed up the privatisation of state property in Greece (and the other heavily indebted countries), which could raise €50 billion or even more. Thirdly, cut Greece’s budget defi cit from the current 12.5% (which is more than four times greater than the EU limit) to 9% next year, and still more year by year, through cutting public spending, including reduced payments to households and direct spending for purchasing products and services. The problem of Greece’s debt could be resolved in a ‘natural’ way, so why hasn’t it? Who benefits from the constant media pressure and continually putting off the problem until tomorrow? One answer that suggests itself is that the European exporting countries benefi t. Not only don’t they like the current euro/dollar rate of more than 1.4/1, they would like to see it below 1.2. Just as surely, they wouldn’t like to see the euro go into freefall, either. That is why the solution to the eurozone debt problem may need to be stretched out in time and space, to smooth out the bumps. The economies of Germany, France, Holland and Italy need a more efficient exchange rate to be more competitive globally, because they are in the same market as the US and China, whose exchange rate for a number of reasons has never been unbound from the dollar. That’s why we are facing such a tricky situation. Stanislav Mashagin is deputy director general of the investment firm Ursa-Capital.